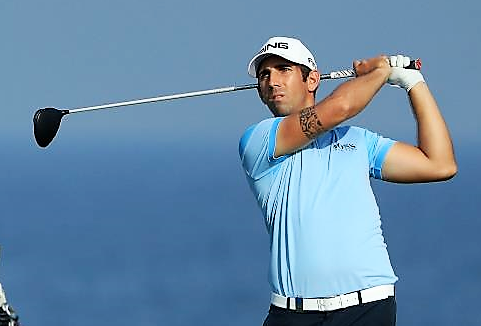 Matthieu Pavon, picture above by courtesy of Getty Images, stormed to the halfway lead at the NBO Oman Open, thanks to a hot streak which yielded eight birdies in the space of 11 holes. A seven-under, second-round 65 handing the Frenchman a two-stroke advantage with a tally of 11-under 133 going into the weekend at the spectacular Al Mouj Golf in Muscat. The 25 year old is one of the few players in the field this week to have experienced the epic Greg Norman-designed links overlooking the Gulf of Oman, and one of the fewer number of players to have very happy memories, having claimed a top three finish at the Challenge Tour’s season-ending event here in 2015 to wrap up his European Tour card for the first time. He put that know-how to good use on day two as he dropped just one shot to put some space between himself and second-placed Matthew Southgate, who would have shared the overnight lead had he not finished with a double-bogey six at the 18th, signing for a two-under 70 and nine under 135 36-hole total. Southgate’s first round co-leader Paul Waring also struggled to build on a strong start as a one under par 71 left him on eight under alongside English compatriot Chris Wood, who carded a flawless 66. Wood’s European Captain at The 2016 Ryder Cup, Darren Clarke, was another player to record a bogey-free second round in the Omani capital as the Northern Irishman made the halfway cut for the second time in as many appearances following a long barren spell of weekend golf. “It's a lot of good memories that helps me out here. When you play bad on some courses and you are going back the next year, you have some bad memories. Here is just the opposite. I just have so many good memories so I just try to surf on them. “I'm feeling good in my game, I’m very happy right now so I'll just take it easy and we will see what happens. “I really enjoyed every part of my game today. Everything was really consistent and solid, I played a lot of good shots, holed a few really good putts so everything was just perfect. I just love the course, I was focusing on getting more and more birdies. I just had my mind on my game. “I played really nice, very similar to yesterday. I feel really in control of my game and emotionally I've been really good on the course. I just switched off a little bit on the 18th tee there. I've just hit a poor swing and made a poor error and I'm kind of not surprised. It's a hot day and it's taken a lot out of me. “These things happen, I didn't mean to do it and I certainly won't mean to do it again. There's going to be hundreds of shots that I hit in my career that I'm not happy with and that was just one of them. “I think I'm playing the best golf of my life which is the goal, because I look to just improve all the time. I feel really in control of my swing and I feel a lot more level-headed playing a golf course like this where the scoring is not ridiculously low. “There are birdie chances but you've really got to hit good shots and that's something that I've always enjoyed. I feel like I switch on a bit when it gets a bit tougher. “I think it's a nice position to go into the weekend when you're completely in love with the golf course and you're probably going to be leading or there or thereabouts. No complaints technique-wise or mental-wise so we'll see what we can do. “Some of the pins are a bit more tucked today so it's a bit difficult to actually hit it close even without the wind. I just didn't quite get it going today which is a bit disappointing but I'm happy to be where I am. “You've got to take it as it comes. Some days you don't know what Paul Waring is going to wake up out of bed so you need to see what happens and take it from there. “I didn't give myself any chances today which is a bit annoying, struggled a little bit with pace control with the putter as well. “Those two days were more enjoyable then the last six months or so, that’s for sure. I just dropped one shot over two rounds and that was a three-putt yesterday. It’s good, finally a bit of progress which is nice because when you struggle with this game it can get you down a bit. It’s nice that I’m seeing the light now. “I’ve missed three cuts this season already but at the Dubai Desert Classic I definitely felt like my game was coming - I just needed two more rounds to just put a 67 or 68 in and feel like it’s really coming. “But I missed the cut there by a couple in Dubai. You feel like it’s getting there but you need the golf. I’ve put in a lot of work at home and it’s nice to put a score on the board at last. I can’t remember the last time I shot in the 60s.